Save up to 80% on App Distribution by Eliminating Fraud! It is not a secret that click fraud and installation fraud might be taking as much as 80% of developers’ App distribution budget. Integrate WeEyeD App Install Fraud Detection SDK to your APP harnesses the power of Big Data as we utilize over 15 Billion monthly records to profile the potential user by location wireless networks, the devices, installed Apps usage, movement patterns and many other metrics in order to profile the users, authenticate the devices and create a fraud rank and probability. Once the SDK is deployed in the App you will have access to a set of dashboards and reports a generated daily for fraud by channel. App distribution can be altered to use only channels without low fraudulent probability thush making better campign spendings and bring significant saving in distribution. 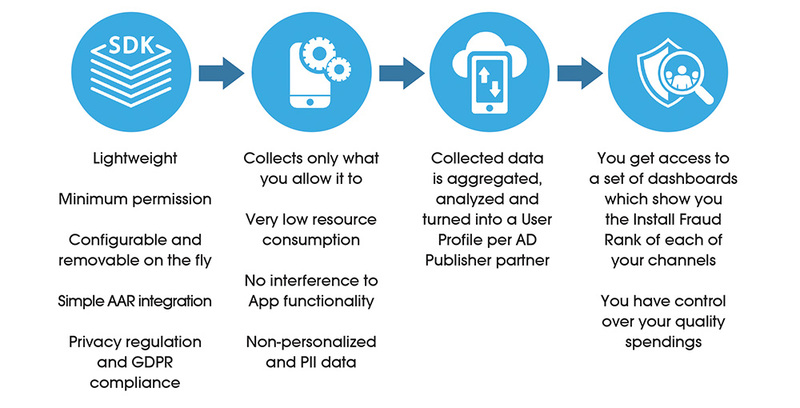 Stay in control of App Distribution costs using WeEyeD!